It started with a garage sale. I have been collecting old Johnson outboards for a few years, eventually gathering up the whole 1956 lineup, from 3 to 30 HP, my favorite motors. A friend of mine spotted an old Johnson outboard at a garage sale not far from my house, so being a good friend, he called me and let me know that I should go by with him and see it. I pretty much had all the outboards I “needed”, but to be polite I said, sure, let’s go take a look. The motor turned out to be a very clean ‘57 10 HP, and I struck up a conversation with the owner, showing him some photos of my collection and assuring him that he had a decent motor but I wasn’t interested. That’s’ when fate stepped in. He had a 3 car garage with the 3rd bay separated by a wall and his garage sale took up the 2 car section. He told me if I was interested in old outboards and boats then I would probably be interested in what he had hidden in the 3rd bay. Stored since the late 80’s was an old wood lapstrake boat just piled to the ceiling with junk. Of course, I was interested. The guy told me he had purchased the boat in upstate New York from an 85-year-old gentleman who owned the boat since new and had only used it a few times. There was so much junk in the boat it was hard to tell the condition of the hull but from what I could see it looked intact. The motor looked like it had hardly been used, with original paint right down to the bottom of the skeg. Not knowing much about Thompson boats, I did some research on line and found a Thompson website and two gentlemen, Miles Kapper and Andreas Jordahl Rhude, who knew all about the Thompson story. They helped me determine that the boat was a 1963 Luxury Skiff, built in Cortland New York. They also cleared up the confusion about the Chris Craft logo on the dashboard and Thompson logo on the hull. Turns out Chris Craft bought the Thompson boat company in Cortland in 1962 and marketed their boats as “Thompson, Subsidiary of Chris Craft”. They closed out wood boat production in 1965 as fiberglass took over. After speaking with the experts, I went back and took a good close look at the inside of the hull particularly at the bow and at the transom, and it looked totally intact, so we made a deal and I took it home. In boxes came all the deck hardware, trim tabs, engine parts and pretty much everything that belonged to the boat including the original convertible top and side curtains. At first, I thought maybe a good cleaning and quick repaint would be enough, but as I started dismantling the boat, I realized the right thing to do would be to strip it down to the bare hull, flip it over and really do it right, so that’s how we proceeded. 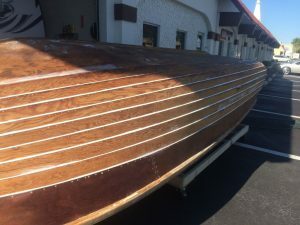 We treated the bare wood hull with a few coats of Smith’s CPES clear penetrating epoxy and then caulked the seams with 3M 5200, which for a while I thought might have been a mistake because I was afraid the paint wouldn’t stick to it. Once the 5200 cured we were able to sand it and then we used Petit Tie Coat Primer before the George Kirby finish coats, and it is holding up very well. The deck on this boat was covered with white vinyl that was stained and couldn’t be cleaned, so once we removed it, we realized the underlying plywood was beautiful mahogany, and so we just sealed and varnished it. The only wood needing replacement on the whole boat was a decorative covering board on the bow deck and one piece of plywood in the engine well. For the interior, we replaced all the wiring, cleaned and reinstalled steering and engine controls, repainted and reinstalled the side panels, and peeled all of the original vinyl flooring and replaced it with new nautolex. The seats were all original and only needed a good cleaning. The engine is a 1960 75 HP Evinrude Starflite V4. We were so impressed with the condition we decided not to repaint it. The only things it needed were new fuel lines, carburetor cleaning, water pump and some lower unit seals. I also lined the inside of the engine cover with foam for sound attenuation. The engine started and ran great, just some carburetor adjustments required. The boat came with its original Holslaw trailer, which I give credit to for keeping the keel nice and straight since it was supported all across its length. New tires and wheels, wiring and lights plus a repaint with Rustoleum, plus we had a hinged tongue installed to make it fit in the garage. After almost a year’s worth of elbow grease we launched the boat in November 2017 and boy did it run great. I had never ridden in a wood lapstrake boat before and I was very impressed with the way it rode and handled. The most joy I had with this project was involving my 8-year-old grandson plus friends and family to make this a team effort. We enjoyed sharing the boat with fellow classic boat enthusiasts during the 2018 Sunnyland Classic Boat Festival in Tavares, FL. It’s just a matter of time before the next project finds me. Back in the early 60s, our family had an 18′ Thompson with a similar Evinrude 35 and for some reason, I recall it being associated with manufacture in NYS. Years later, while visiting the Finger Lakes, I learned more about Penn Yan boats, but no sign of Thompson. So your discussion of it being made in central NYS Cortland (and eventually becoming Chris Craft) closes that vague gap in my memory. Thank you! Handsome piece; hoipe it “finds you” pleasure! Your Holsclaw trailer was produced in Evansville, IN. 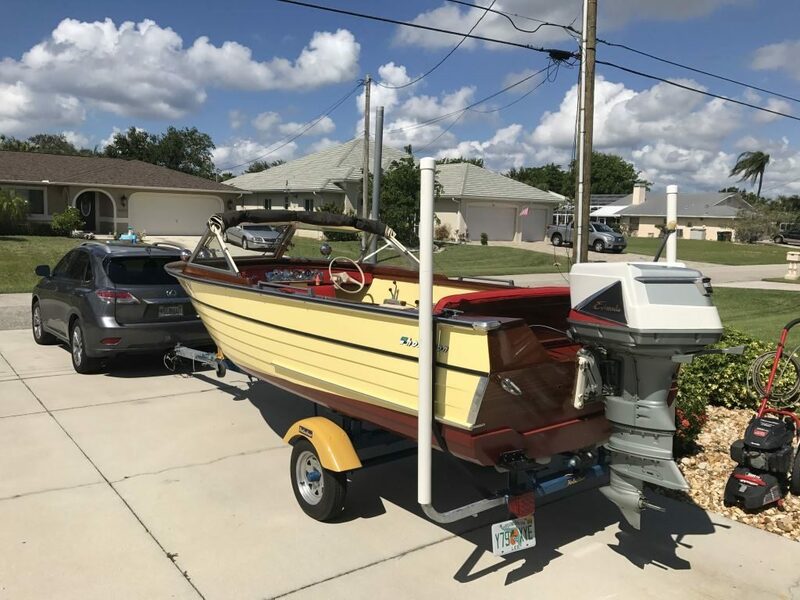 The Holdclaw trailer I had under a lapstrake 26.5’ SkiffCraft hardtop powered by a MerCruiser (GMC 327) I/O in Plain City, OH, was a dual axle with coil springs + shocks, & tongue extension. You have a premium rig! You did a great job on the re-store . What is your next re-store job going to be? Glad she found you, she’s a beauty. 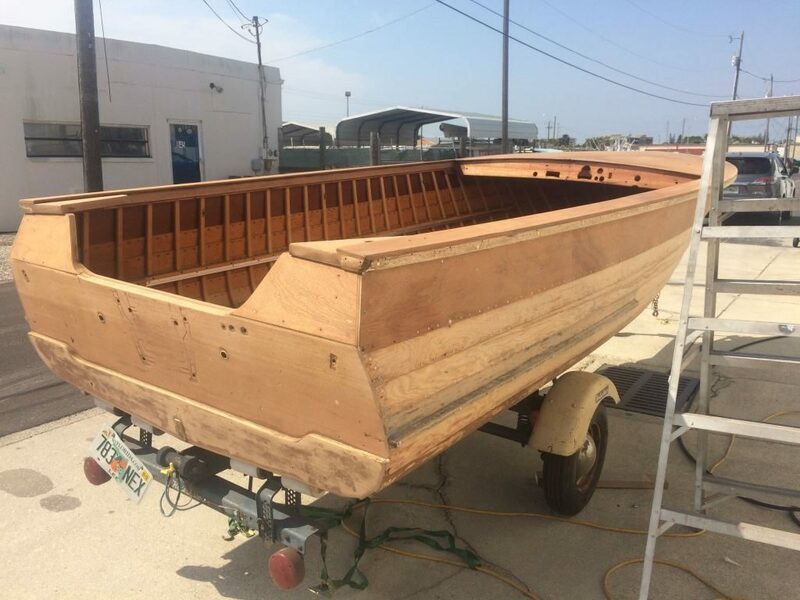 I have a pre W W 2 Thompson 14’ runabout built in Peshtiga, WI, utilizing narrow cedar strips for the hull & decks + the floor boards fastened with round head brass nails. The two brothers split with the one opening the Cortland, NY, plant producing the lapstrake bulls fastened utilizing brass bolts & nuts + flat washers. The clear varnish on the interior kept the nuts tightly fastened. Your historical information is not accurate. No one split to form the Cortland, NY branch factory. Thompson Bros. Boat Mfg. Co, was established in 1904 at Peshtigo, Wisconsin. It eventually encompassed six brothers and their sister Hanna and several brother in laws. In 1925 they opened a branch factory at Cortland, NY and brother Tom (Adolph) and sister Hanna went there to run it. Bob Thompson, son of Christian Thompson, came to Cortland to become manager around 1950 when his uncle Tom returned to Peshtigo and retired. Meanwhile the six, second generation Thompson family members started Cruisers, Inc. at Oconto, WI in 1953. It was formed with the full blessing and knowledge and cooperation of Thompson Bros. Boat Mfg. Co. and the first generation Thompson family members. In January 1959 the three Thompson owned boat factories were split amongst various family groups and the first generation officially retired. Ray and family become sole owners of Peshtigo plant which retained the name Thompson Bros. Boat Mfg. 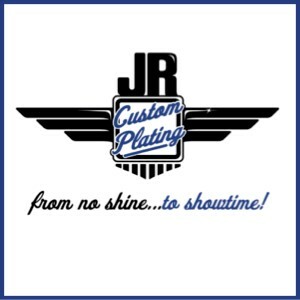 Co. Brothers Roy and Grant became sole owners of Cruisers, Inc. Brothers Bob and Ted, Jr. and their cousin Glenn became owners of the Cortland operation which was now named Thompson Boat Company of New York, Inc. The three firms started to compete with each other at that time. In January 1962 Chris-Craft purchased Thompson Boat Company of New York, Inc. at Cortland which became a wholly owned subsidiary. The Cortland guys also established Thompson Royal-Craft, Inc. in 1959 to make royalite rubber boats. Glenn Thompson departed Thompson of NY in 1960 and returned to Wisconsin and formed T & T Boats, Inc. at Wausaukee.